Static electricity is always a popular topic with my scientists. Why? In part, I think it’s fun to learn about something that we all experience pretty much on a daily basis. When you walk across the floor in your socks and then get a shock when you touch the TV – that’s static electricity. When you see lightning flash during a summer storm – that’s static electricity. [FUN FACT: Did you know that lightning not only goes from clouds down to the ground, but it can also go from cloud to cloud and from ground to cloud?] And the list of static electricity examples could go on and on. To get us ready for the day’s experiments, we first briefly discussed what static electricity is and how it can be created. All matter is made up of tiny things called atoms. And in each atom, there are protons (+), neutrons, and electrons (-). Normally, an atom has an equal number of protons and electrons, so the atom itself is neutral with no charge. But if the conditions change and there are more protons in the atom, then that atom becomes positively charged. Likewise, if the conditions change and there are more electrons in the atom, that atom becomes negatively charged. Take as an example the static electricity reaction you sometimes see after you comb your hair. When you drag a comb through your hair, the comb is attracting the electrons from the atoms in your hair. The comb becomes negatively charged as electrons stick to it, and your hair becomes positively charged as the electrons are removed from it. Your hair strands would be drawn toward the comb if you held it above your head – opposite charges attract each other. On the other hand, your strands of hair try to push away from each other because of their like charge – like charges repel each other. We watched a few youtube videos to get us in the right scientific frame of mind as well, some of which are included below. Bill Nye the Science Guy talks about how a Van de Graaf generator works. And National Geographic gave us some great information on how lightning works. OUR PROJECTS FOR THE DAY: Leyden Jars and Floating Tinsel Orbs! NOTE: I finally invested in a battery-operated static-generating “fun fly stick.” VERY handy because every time I’ve done a static program, our success at generating static for the activities varies. This way, I could help less-successful scientists test out their projects. I pre-cut strips of tin foil for all to use (approximately 2″ x 5″). Step one was smoothing out the foil and putting some glue on the less shiny side. We then wrapped the foil on the outer side of the empty film canister, making sure the foil was as smooth as possible. [The foil should overlap slightly.] Placement of the foil is important. You do not need to have the foil go all the way up to where the lid attaches; rather, it’s more important that there is extra foil at the bottom end of the canister to wrap over the bottom of the canister (though the bottom also does not need to be fully covered with foil). Next, we pushed the straight edge of the paperclip through the center of the film canister lid. We then pulled the lid off and filled the container about 2/3 to 3/4 full of water. [You can dissolve some salt in the water if you’d like to try and enhance how well the static electricity is carried through the device.] With the lid back on and in place (the straight edge of the paper clip should be in the water, though not touching the bottom of the container), we just needed to charge our leyden jars. This is the tricky part. We rubbed our PVC ‘wands’ on our clothes and hair to create a static charge, and then we touched the wands to the PAPERCLIP ONLY to transfer that charge to the leyden jar. It’s very important that you only touch the paperclip; if you touch the plastic part of the case’s lid, you will neutralize (or eliminate) the charge. Likewise, you have to be very careful to ONLY TOUCH THE TINFOIL WRAPPING for the very same reason. Once we touched the paperclips with our balloons 10-12 times, we could then test the jar by hopefully giving ourselves a shock! To test the jar, you first put the thumb of one hand on the tin foil. With that same hand, you SLOWLY approach the paperclip with another finger from that same hand. If all is successful, you will feel a small shock (the same level of shock you might get by touching the TV after walking across a rug in a pair of socks). With the lights out, you might even be able to see the spark that occurs between your finger and the paperclip. All of my tests before the program were a success. Sadly, we had less success during the programs themselves…in part because it was a damp day. When there is extra moisture in the air, the water molecules in the air attract a portion of any charge you create and thus make it more difficult to build up a decent charge on the wands, in the jars, etc. 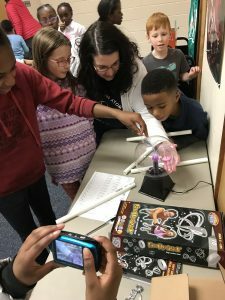 We did have a few scientists successfully feel the shock though, and with the help of my battery-operated static wand, almost everyone tested their jars successfully. I also showed our scientists a really fun trick that just requires a PVC wantd (or balloon) and some tinsel (the kind of tinsel strands some people put on their Christmas trees!). First, you take about six strands of tinsel and tie them together in a knot at each end. You probably don’t want your “orb” to have strands longer than 4-5 inches. Next, you charge your wand by rubbing it against your hair, clothes, or any other item that you think might help. The trick itself takes a little practice, and often a few attempts. But when successful, you drop the tinsel onto the charged wand and after it quick touches the wand’s surface, it then bounces off and floats above the wand in mid-air, like it’s levitating! Why does this happen? Initially, the wand and the tinsel have opposite charges and are attracted to each other. But once they touch, they carry the same charge…and as you know, like charges repel. Thus, the floating tinsel orb! 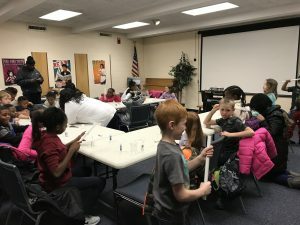 I set up a few stations where the scientists could test some objects using their PVC wands. ELECTROSCOPE. I created a simple electroscope using a glass mason jar, a paperclip, and old envelope, and some small stips of tin foil. When you touch the top of the paperclip with a static-charged object, the two foil strips push apart from each other. BUBBLES LIKE STATIC?! I set up a table covered in a disposable tablecloth. I spread some homemade bubble solution on the surface, and then demonstrated how the scientists could use static to attract bubbles. You blow a bubble on the surface of the table, charge your static object, and then place it near the bubble. The bubble will actually move across the surface of the table towards the statically-charged object! My 7-inch Plasma Globe. 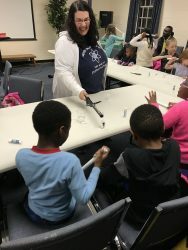 I like to share some of my fun science toys with the group when possible. I put my plasma globe on table for the scientists to play with during the program as well. How does it work? The small Tesla Coil in the globe produces an alternating high voltage potential which attracts or repels free electrons. When the electrons collide with the gaseous atoms and molecules trapped inside the globe, the gas particles are ionized creating even more electrons, as well as positive ions. A plasma is formed. When electrons return to the ionized gas, light is produced. Touching the globe with your finger provides a ground, an additional source or ‘sink’ of electrons. The scientists had a blast testing out the plasma globe! Our December SEC program is always a full-house, and it was great to see all of my scientists – new and old – having fun with siblings and caregivers throughout the program. We’ll be taking a short break in January, but SEC will return in February. Happy holidays to all! 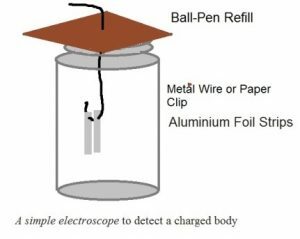 This entry was posted in Science Explorers Club and tagged electroscope, leyden jar, static, static electricity on December 20, 2017 .